A warm and zingy salad studded with fresh pomegranate seeds, which makes a refreshingly light lunch or supper dish. Preheat the oven to 200°C, gas mark 6. Season the chicken and smear with 1 tablespoon mustard. Place in a small roasting tin and bake for 25-30 minutes or until cooked through. Set aside to rest for 5 minutes. Spread the chunks of bread on a baking tray, drizzle ½ teaspoon olive oil over and season. Mix using your hands, to coat the bread. Cook in the oven for 10 minutes or until the bread is golden and toasted. To make the dressing, place the clementine juice, the vinegar, and remaining oil and mustard in a small bowl. Whisk until smooth then season to taste. Remove the seeds from the pomegranate and place half of them in a large mixing bowl with the salad leaves. Cut the warm chicken into long diagonal slices and add to the bowl. Pour in the dressing and gently toss the salad. Divide the salad between 2 serving plates. 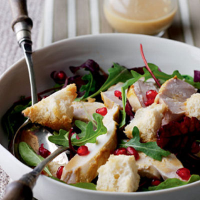 Sprinkle with the remaining pomegranate seeds and the croutons, then serve. For a quicker version of this salad, swap the chicken for Waitrose Roast Chicken Breast Fillets or shred in leftover roast chicken or turkey meat. For more about how to prepare a pomegranate go to waitrose.com/stepbystep. Chenin Blanc is a great match for this dish.